June 21, 2016 – ICRAA receives an award from Lord Mayor of Leeds. June 11, 2014 – A new flash flood in Baghlan province destroyed over 850 houses and killed 81 people. May 31, 2014 – Pakistani troops fire 862 rockets into Kunar, around 350 families were displaced. April 24, 2014 – A big disaster occurred in Afghanistan. More than 39,000 people are in need of relief and around 16,000 are displaced. 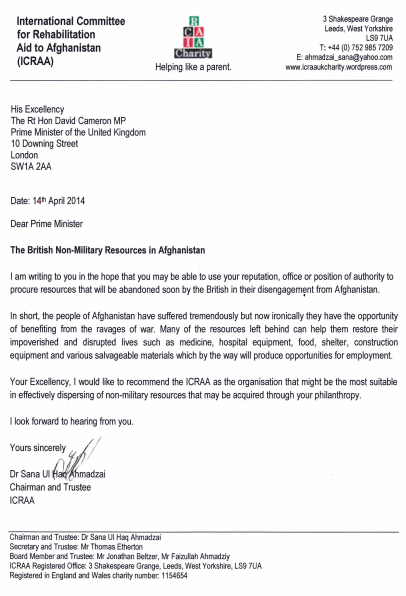 April 14, 2014 – ICRAA request for British Non-Military equipment in Afghanistan. February 2019 – Refugee Week London. March 2019 – Afghan Peace Conference 2019, Kabul. December 2018 – PMNCH Partner’s Forum, India. June 2017 – Afghanistan Peace Conference. November 30, 2016 – Trust Women Conference, London, UK. September 21, 2016 – Geneva Peace Talks 2016. November 20, 2014 – ICRAA turns one-year-old. October 18, 2014 – ICRAA 2014 Annual General Meeting. May 22, 2014 – NCVO Members’ Assembly meeting in Bristol.